I just learned that Judy Rodgers passed away. I never met her. I never even made a recipe from her Zuni Café cookbook, which I’ve had on my shelf for years. But I do remember one lunch at the Zuni Café about a decade ago that has had a lasting impact on me—a special meal that felt a bit like a rite of passage into the foodie universe. I’m not going to name names, or name-drop, but let me set the stage: I was launching Organic Style magazine and it was Alice Waters’ epic 30th Anniversary Picnic for Chez Panisse. So I went with a bunch of foodie insiders to both cover the lunch and do a bit of an organic tour of the Bay Area food scene. 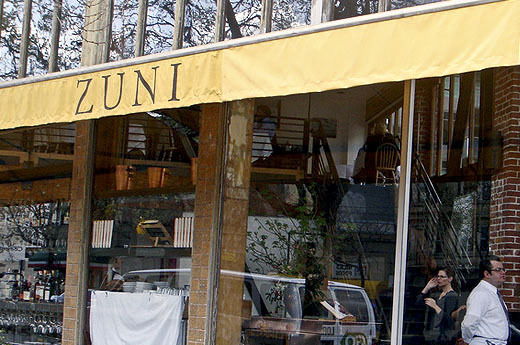 Of course that meant having a meal at the Zuni Café. There were, I believe, four of us, and the only thing I remember we had to do that day was eat a leisurely lunch. Which we did. The first thing I recall about it is that we shared everything. I’ve never been a great food sharer, but it did seem an efficient way to try as many dishes as possible. We had plate after plate of foods that were so simple and so fresh. This seemed the time when the food world was splitting off into factions that would get even farther apart in the years ahead: On the one hand, you had the whole super-high-end, overthought, and perfectionist food, usually accompanied by some sort of foam. And on the other, you had the side represented by people like Judy Rogers, who was farm-to-table before that was even a term. This was just good, plain, real, absolutely delicious food. The second thing I remember vividly with shock and delight was that everyone ate with their fingers. FINALLY, I HAD FOUND MY PEOPLE! Ever since I was a small child, my mother lamented my reluctance to use food utensils. But I never knew how to put into words that for me the sense of touch is so much a part of the sense of taste. I don’t think you can really taste a food unless you’ve touched it. Suddenly, a quirky childhood habit that I could never break became like a secret handshake into an exclusive club. A club I wanted to belong to. There were a lot of other things I remember from that weekend. I met the absolutely lovely Marion Cunningham. I got to see Ruth Reichl up close during her reign as queen. And the Chez Panisse 30th Anniversary lunch was incredible (I still have the menu framed in my office). I vaguely remember a small dinner the night before for many of the farmers; I can still distinctly taste the sweetness of a grilled peach. But mainly, I learned, beginning at that lunch at the Zuni Café, that the best food in the world is the simplest, freshest, and most sensual, especially when enjoyed with all the senses, including—permission finally granted—touch. A number of chefs have died this year: Charlie Trotter was one of the first high-end chefs to work directly with inner-city community gardens; Marcella Hazan’s famous simple tomato sauce recipe is one I’ve made for years—not because I read it in a book or saw it on TV but because a coworker had learned it directly from her (add to fresh sauce one whole onion and lots of butter. Yes, it’s that simple). But Judy Rodgers’ death hit me the hardest. I think it’s time I finally read her cookbook. Front to back. The whole thing. Because, as with all great cooks, she will live on through her recipes. I think hoping to be remembered after we die is one of the deepest human longings. You are truly honoring all of these good cooks by keeping their memory alive through their recipes and through your memories of them. For doing that, I thank you. Maria's Farm Country Kitchen: …. Worth having a look? Or maybe just my browser? If you are the president of the Touch My Food club, can I be the Vice Prez? I have always said that the person who invented the fork was Either in a great hurry or just mean spirited!